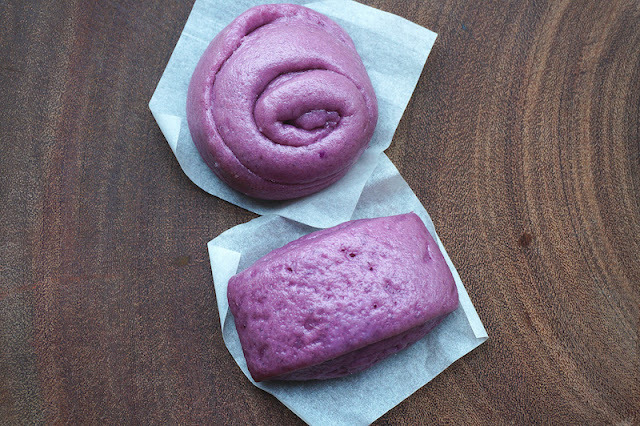 These steamed sweet potato buns are soft, sweet and delicious. They are great as it is, and tastes best hot, straight from the steamer or at room temperature. Steam the sweet potatoes on high heat for about 15 to 18 minutes until just tender. Remove and mash the potatoes with cane sugar. Combine milk, yeast, oil, milk, flour, and mash sweet potatoes mixture and knead until smooth, and soft. Place the dough in a lightly oiled bowl. Cover the bowl with a piece of cling film and set aside in a warm place for about 1 to 1 1/2 hours until the dough has doubled in bulk. Place the dough on a floured board. Let the dough rest for about 5 minutes. Flatten the dough with your palm, and roll into a thin rectangular shape (about 12 by 10-inches) with a rolling pin. Starting with the edge closest (the long end) to you and roll up the dough. Then gently roll the dough to even it. Roll up the dough as tightly as you can. Pinch both ends, and slice the log into ¾ to 1-inch rounds. Place the rolls on the parchment paper. Cover with cling films and let it rest for about 30 to 40 minutes. Set the steamer on high heat and steam the buns over rapid boiling water for about 12 to 15 minutes. Switch off the heat and open the cover slightly ajar for 5 minutes. Then remove and serve warm.